Dissemination of the best practices - use of demountables (Task 6.2). Prague is the capital of the Czech Republic with about 1.5 million inhabitants. It is located at the river Vltava (Moldava). 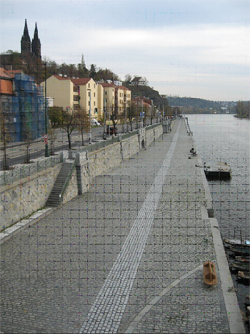 In 2002, Prague received significant damage from what were deemed to be the worst floods to hit the capital in 200 years.There are several kinds of local flood protection measures in Prague including lines of mobile barriers, which are used uniformly on the entire area of Prague, primarily in the historic urban centre. The total length of these mobile barriers is about 7 km in Prague. The dam bar system was created by the firm Eko-System. Relevance to Task 3.2: In Prague, the geophysical methods can be applied to monitor the disturbances of protective structures (their routine maintenance), and also to diagnose damage after extensive floods. 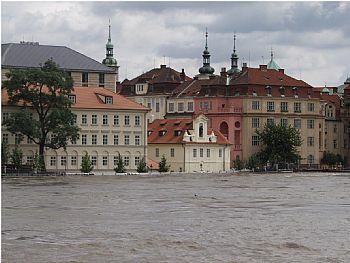 Relevance to Task 4.1: During the design and construction phase of the Prague Flood Defence System, some riverside areas were in the private property with intention to build dwelling houses. As these houses were designed in the flooded area, and to allow the owner his plans the houses were designed to be flood-proof to the anticipated water level and therefore they became a stabile part of the whole system of demountable barriers. Method for assessing homogenity of urban flood defences (Geophysical Monitoring System - GMS). Technologies and design for multifunctional flood defences – demountable barriers, flood-proof buildings. Why we would like to transfer the geophysical experiences from Prague pilot site? Water level fluctuation and water flows during the floods affect the geological setting in the vicinity of bridge and tunnel foundations, thus impacting service life of the entire structure. Disturbances in the underlying layers may come out in the form of defects in the statics and changed behaviour of the entire structure. This can be registered through the monitoring of bridge structure vibrations. In addition to visible damage to the structures and their furnishing directly caused by water, disturbances of geological underlying layers (occurrence of cavities, degradation of soils by washing out fine-grained particles, contamination of subsoil, etc.) often occur. Such damage is not immediately visible, the detection and rectification thereof may take even several years after the flood. The total level of damage caused by disturbances of geological underlying layers may finally be even higher than direct damage caused by flooding of the structures.